"Baby, went to Amsterdam, and she put some money into traveling..." was the song I had in replay back in uni. It was such a fun song by Peter Bjorn and John. I knew, Amsterdam was calling for me. My Dutch aunty Swuan, always says to me, "Stay as long as you want". I really wish I could, but with a design studio in Sydney, all I have is 4 weeks in lovely Holland. But can I say, it's damn good to be back again in Holland! Everything was as pretty as I've remembered 5 years ago. Last trip was wintry and cold, but my visit this time, was filled with so much warmth and joy with the sweetest blooms to admire along the way. I spent my days in Amsterdam, Rotterdam, Eindhoven, Masstricht and Gröningen. I could easily live here and dream away, drawing the pretty Dutch houses on the canals all day long. Amsterdam has an estimated number of 847 thousand bikes for it's 850 thousand or so Amsterdammers. It kind of sounded crazy as each household, owns 1.9 bikes, according to AmsterdamFaq. There are 165 canals and 1281 bridges to travel when in the pretty city. Most Dutch cities have names ending with "dam" as an added suffix. Well, "dam" means "barricade' in English as these dutch places were reclaimed land from the sea. Mokum, what kind of blip is it, you may ask? Derived from the Hebrew word, 'makom', meaning place, is actually a very popular local nickname for Amsterdam. I'm on my aunt's bicycle, zooming around the old Dutch streets, along with the locals. OMG, best fun ever to see any Dutch city with a bike. I love it. It felt, for some reason, I have been living in Holland all along. Doing my rounds in the parks, stopping by my fave supermarkets, Jumbo and Albert Heijn. Popping a load of chocolate bars into my cute bike bag. I keep thinking to myself, Sydney is never this bike friendly. My aunt would tell me that the cyclists are the kings and queens on the Dutch roads and streets. They're always in the right of way. I was impressed they can send text messages and listen to music, and there is no need to wear bike helmets. Well, I'm pointing these out, because I got a public lecture by a policeman in Sydney for breaking all of these 3 rules, haha! Excuse my 'Hodor' inspired 'Hold The Door' moment. I was paying tribute to the Game of Thrones fella back then. I love Amsterdam for it's beautiful 16th and 17th century townhouses. There is no place like it. Now, I found out that there is a HUGE difference between a coffeeshop and a koffie huis. Both shops serve everything you need when you're in a 'normal' cafe, like you know, coffee, tea and cakes. But, the coffeeshop does a little extra, like legal soft drugs (haha!). Anyways, I found myself a super cute koffie huis near the popular dutch square, the Dam. Yummiest scones with homemade jam (think passionfruit and raspberries). I'm trying really hard to remember this koffee huis, but no matter how much I've racked my brain, or google online, or check my location on the iPhone, I simply couldn't find it. If anyone reading this, do know where, please let me know! For a fun variety, Foodhallen is a really cool indoor foodmarket in Amsterdam. There are plenty of drinks and food to choose from. And if you've overeaten, you can always wander away from Foodhallen into other parts of De Hallen Amsterdam, where fashion, film, crafts and architecture meet. I love the converted warehouse where it was one a service area for Amsterdam's first electric trams. At Foodhallen, I had The Butcher's delicious ginormous beef burgers and chips. SNCKBR is such a funky little spot in De Piyp. Think of very delicious and pretty dishes, but healthy as. Generous portion of everything. And anytime is ice cream time. Loads of gelato any time of the day, hehe. There are many ice cream shops in Holland, and they're all just yum! 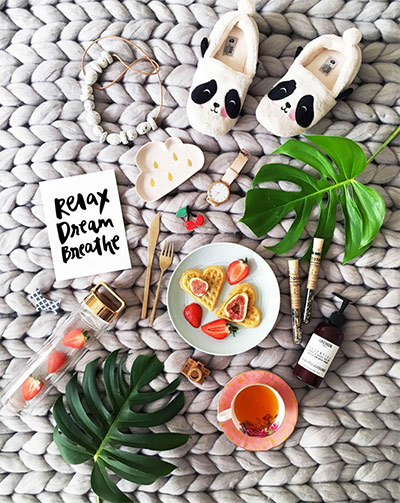 Afternoon tea flatlay with all my favourite things. Two things. Dutch houses and how neat Dutch people are. I'm obsessed with Dutch houses and their beautiful, large windows and doors. Did you know that in the olden days, the wider the house, the more tax one pays? So, that explains why some houses are very slim at the front, and sometimes, they are double the width at the back. A sneaky way indeed not to pay too much tax. Have you seen the Dutch sensibility when it comes to the neatness? It's the beauty in the most simple things, like the door bell to an apartment. There's a really lovely sense of design and balance in everyday Dutch living. I really admire that and I wish I have that in me. Unfortunately, I'm more of an organise chaos person (put it this way, I'm messy!). When it's spring time, the Dutch people really celebrate the coming of new seedlings and first blooms. Everywhere I go, there are pretty little gardens to go ga-ga at. There are flower markets in every town for all your spring needs. If I can, I want to come back to Holland, every spring and bike around with my #instagramhusband, over canals and in little alleyways. That would be a wonderful dream come true.